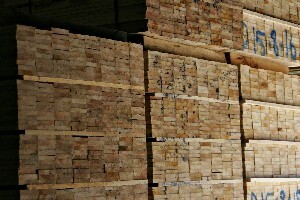 When I saw this post at Make Online about how lumber is made, I knew it’d be interesting. The video is of a device called the Jackson Lumber Harvester 3 Saw Vertical Edger, and it’s the device that turns whole trees into 4×4 and 2×4 cuts of lumber. It’s mesmerizing to see just how quick and how efficient the whole process is. There’s so very little good wood wasted; much less than I had assumed there would be! Even more interesting is that basically none of that wood goes to waste. Even the scraps are used to heat the lumber mill itself and power the firing kilns and the like. And it’s so quick! Turn, cut, turn, cut… the whole process takes only a minute or so, and it requires only one worker to tell the machine what to do. Amazing, isn’t it?